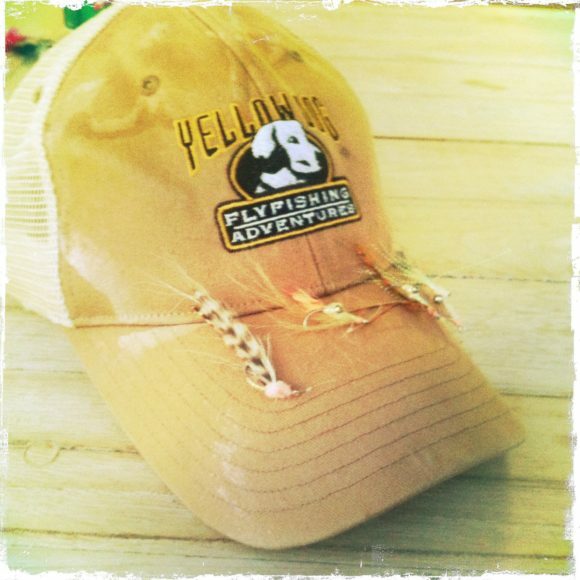 We fly anglers love our gear. 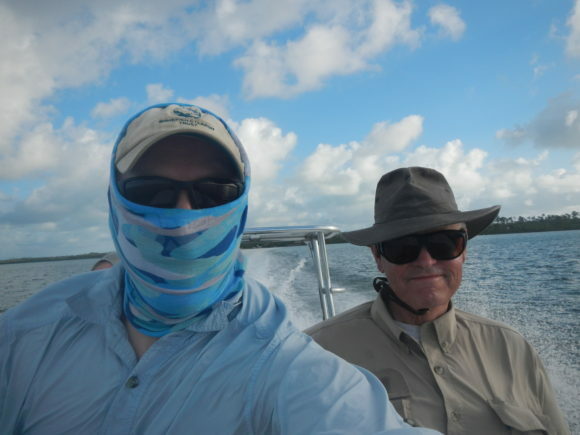 Some (I’m looking at you Aaron) use a trip like this to load up on new rods and reels. I tend to try and make due with what I have, although even I brought in some new tools for this trip. I brought 5 rods with me and used 3. My 12 weight never left the rod tube and my back-up 10 had a similar fate. Both of those rods were the Redington Predators that I’ve been very happy with for years. I brought one loaner rod with me and that was a Sage Salt 10 wt.. This was my go-to GT rod and the rod I used to horse up Milkies and Bluefin Trevally. It’s a solid rod and it cast well. Fast action and easy casting. Sadly, I have to send that one back, as it was a loaner, but it would earn a place in most saltwater quivers. My go to bonefishing rod for the past few years has been my Orvis Helios 2. I’m just comfortable with that rod. We’ve seen things together. Just yesterday I cast an H3 and it felt like a totally different rod (which I didn’t love). I’ll keep my H2 until I snap the thing. 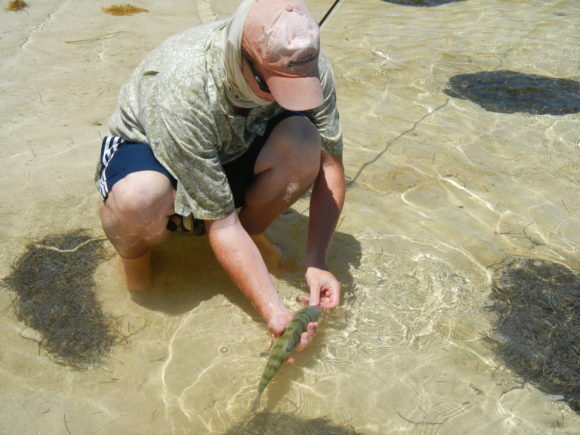 I used a “trigger” rod for part of the trip, a rod rigged up with a crab fly and 20# tippet. This was my Redington Predator 8 wt. 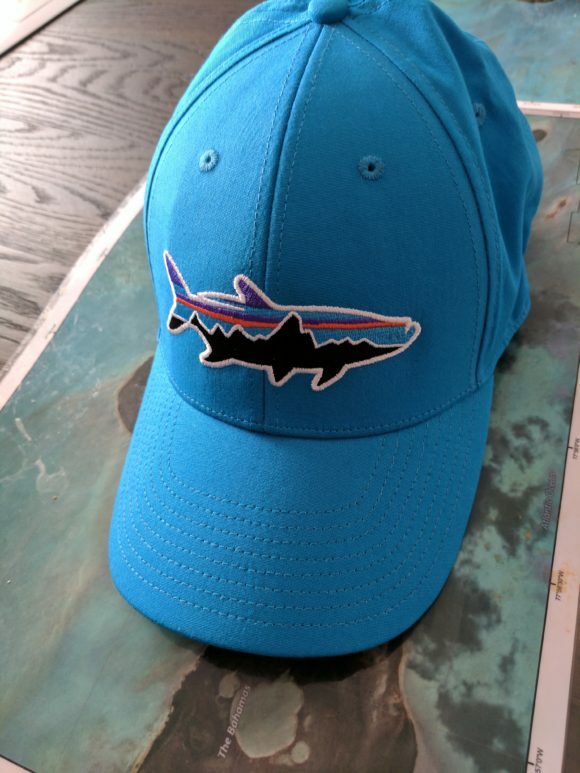 that I picked up last year. I’ve been pretty pleased with this rod, which is on the lower price-point side of things. 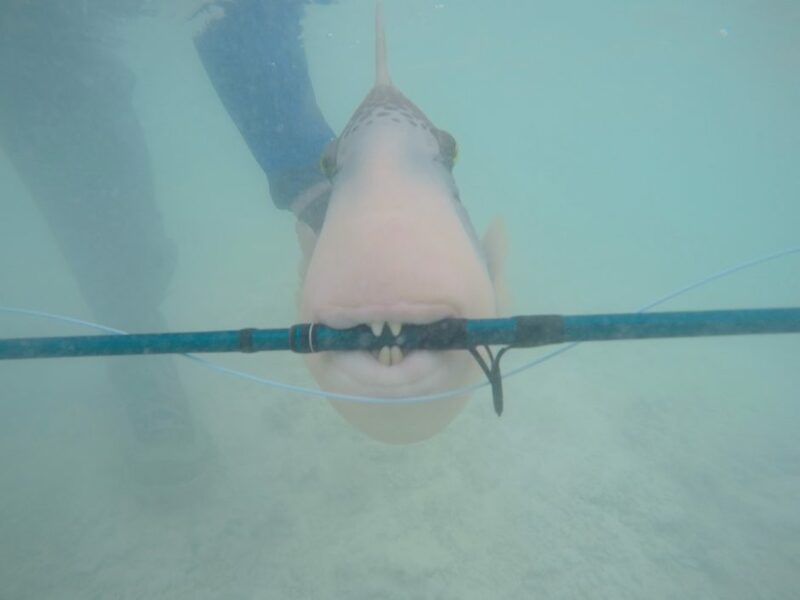 The first trigger I landed in Christmas was on this rod and I had to put the stick to the fish to keep it from heading back to his rocky, coral-lined home. 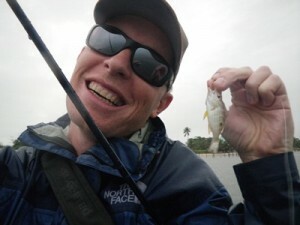 This is the fish that then bit the rod. I am happy to say the rod is in fine shape, which is pretty shocking, but is true nonetheless. I ended up using two new reels on this trip. 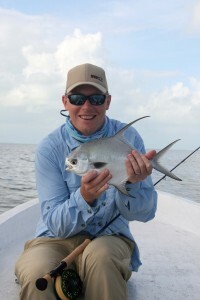 First, I had the Redington Grande, which is a machined version of their Behemoth reel, which I also own and have liked. I had the Grande on the 10 wt. and actually got the larger version of the reel, a 11/12, so I could dump more backing on it. I wish I would have caught more fish on this, but what I saw out of the reel was all positive. 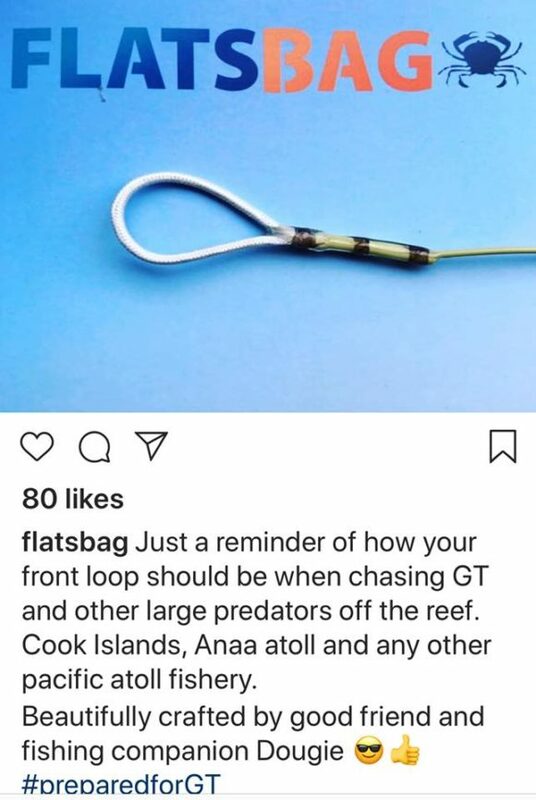 I made a mistake with the reel on my reef-lost GT in that I should have locked the drag down, but I didn’t and the line ended up getting a bit roughed up on the reef. That spelled the last action for the Grande as I moved to the back-up reel which had a new line on it. The back-up reel was the Sage (the SPECTRUM MAX). Solid reel. 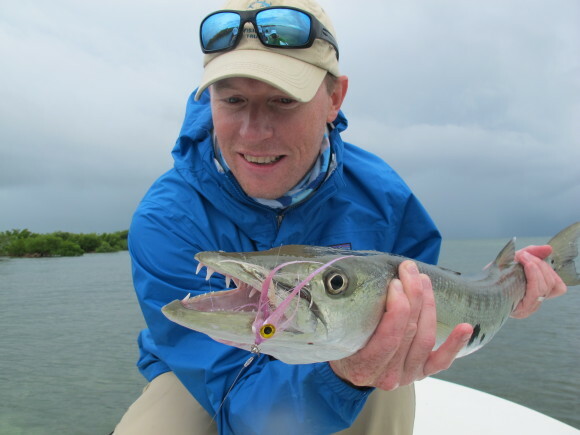 I had no issues with this reel and it did well when pulling those milkfish up from the depths. 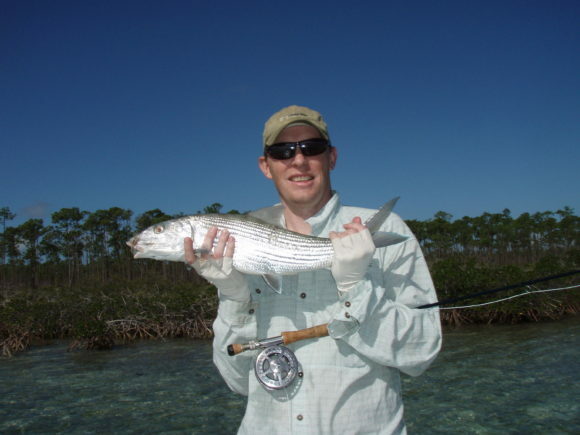 The bonefish reels I used are the ones I’ve been using for years now. 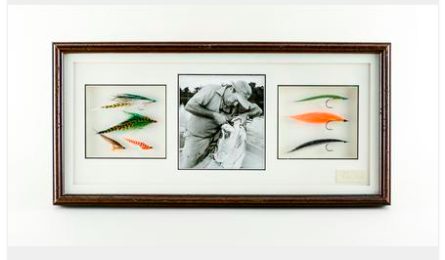 There an Orvis Mirage (the earlier version) and a Lamson (a lightspeed, I think) which is similarly no longer in production. I used to really like Lamson as a reel maker, but they’ve made a succession of odd choices in the past few years. The only lines I used that were really new to me were the RIO GT lines. I had no complaints about these lines. I had made the decision not to monkey with the factory loops and so I should comment that I did have to swap reels because the factory loop on the first reel got pretty messed up on the coral. I can’t think that is the fault of the loop though. The loop to loop connection seemed to be the place on the coral that the line got stuck and the loop was partially cut through in a couple of places. That said, it still held, it was the leader that ended up getting cut. Also, if I had made my own loop the profile would have been even more pronounced and it would have caught even more. I still stand by my decision to use the factory loop. The factory loop held on the milkfish just fine. People land huge GTs on the factory loop. I’ve seen the pics. I ended up getting a pair of Simms flats boots because I was told the booties would not stand up. The boots worked well. I got a pair that were a previous year’s model so they were fairly cheap. That said, a guy on our trip had a pair of the booties, same Simms booties I have, and they stood up to the coral just fine. The Patagonia sun hoodies are all I wear these days. They are just hard to beat. I now have three pairs of that shirt. The Simms sun mask is my go to now. Love the holes which reduce the feeling of breathing through someones hand on my mouth and it also reduces the fogging up of sunglasses. 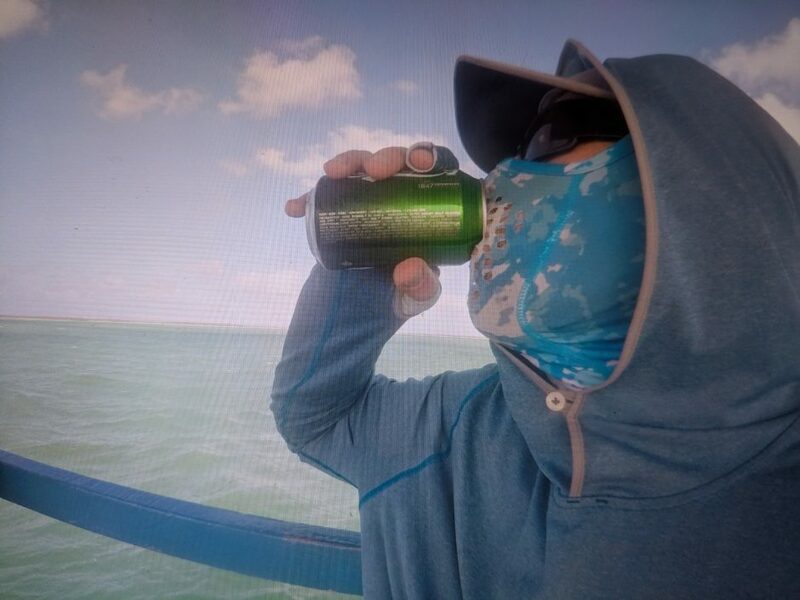 Yes, you can drink a beer through your sun mask. Earplugs. My roommate for the trip very much suffers from un-diagnosed sleep apnea. I never got a solid night’s sleep. Someone on the trip gave me a pair. That was very, very important for how the whole trip went down for me. Body Glide. Nothing would mess up your trip faster than your inner thighs being rubbed raw. Body glide is the answer. I use it proactively pretty much any time I’m spending time in the salt. Antibiotics. Turns out my health plan has a travel clinic. You tell them where you are going and they’ll write you a prescription for what you might need and they’ll also look and see if you need any vaccines. I didn’t get sick on this trip, but I would have been in good shape if I had. 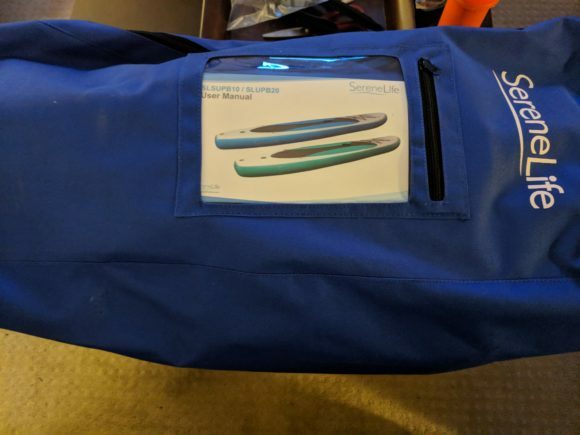 I needed a big, waterproof bag and I didn’t want to break the bank. Enter the Outcast AK Duffle. This thing is HUGE (no, I was not over weight). 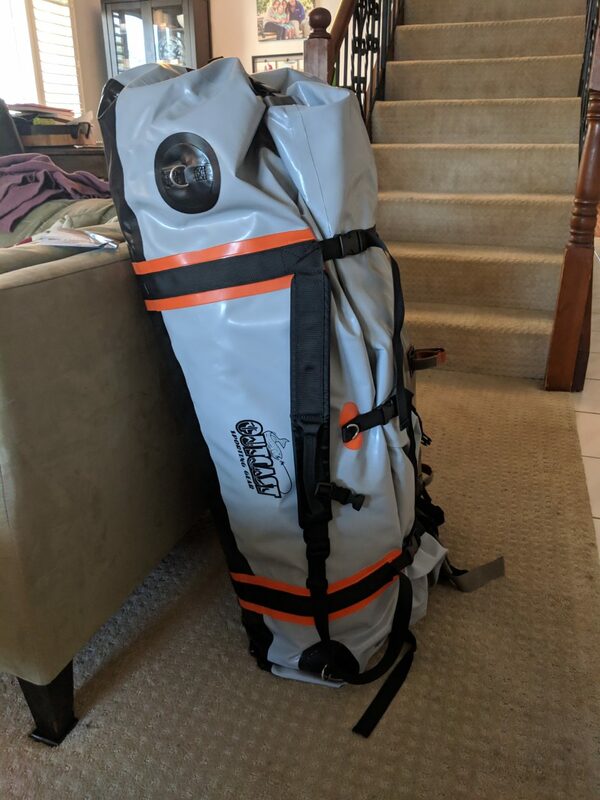 I could fit my rods IN the bag. Really pleased with this thing. Lefty Kreh meant a lot to a lot of people. If you’d like to get a piece of Lefty, you can, and in the process you can benefit his family. There’s an action going on now for some of his possessions and proceeds go to his family. 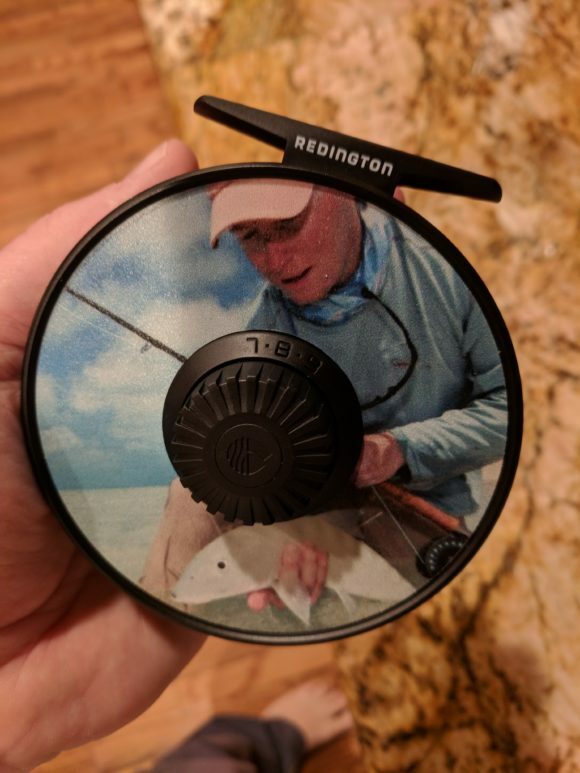 Introducing the new Redington I.D. reel. 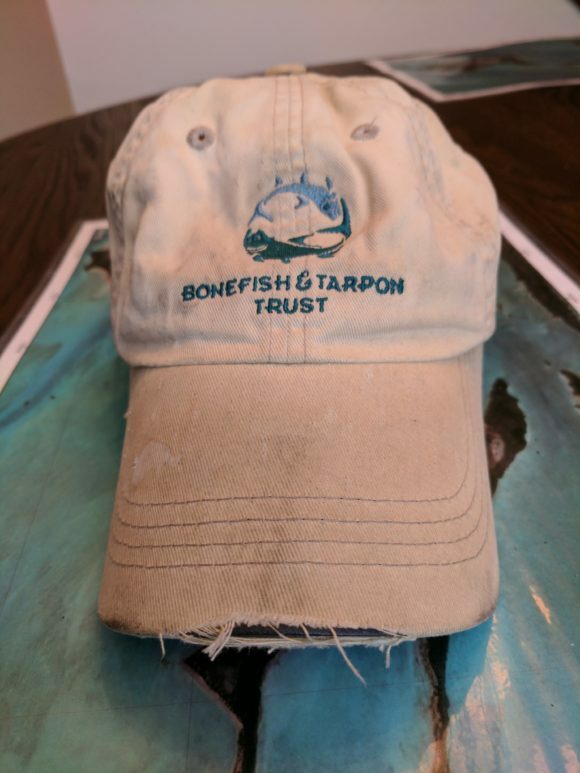 This is probably going to go on my striper rig. YOU DO NOT NEED NEW GEAR! Now… let me show you my new gear. We are full of contradictions and inconsistencies and that proves one thing. We are human. When I read about a $1,100 trout rod I was incredulous. “Stupid” I thought. 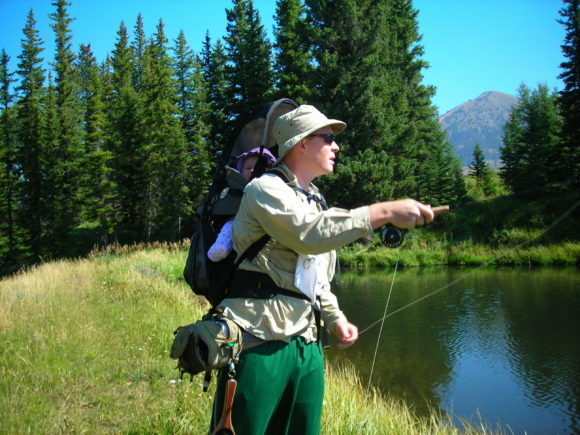 No trout (OK, almost no trout) is going to really, really test your tackle. 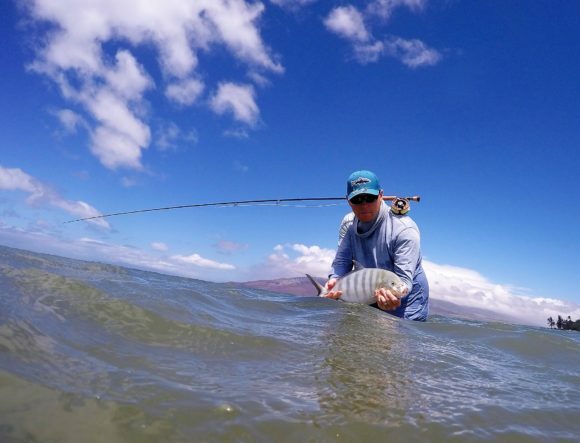 You don’t need space-age materials to land a 14″ rainbow. 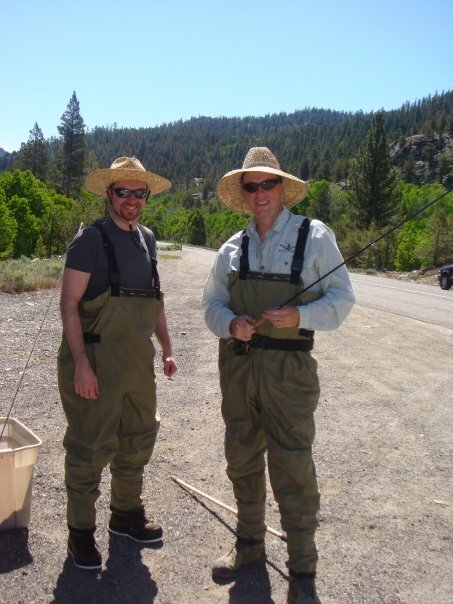 Man, we fly fishermen are a gullible lot. But… I really did want a back-up 8 wt. 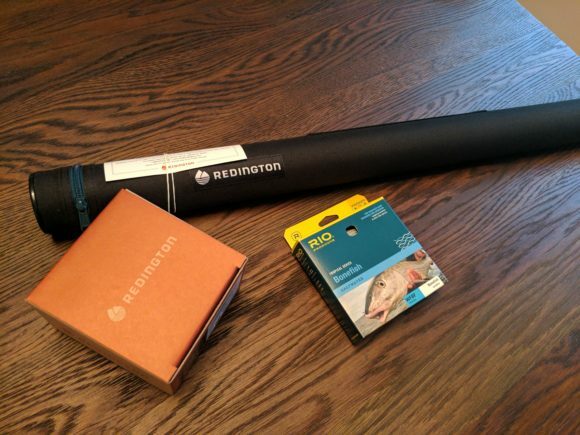 and when I cast the newly re-launched Predator rod from Redington, I kind of wanted it. I have an 8 wt. A really good one. I also have two other 8’s that work in a pinch. 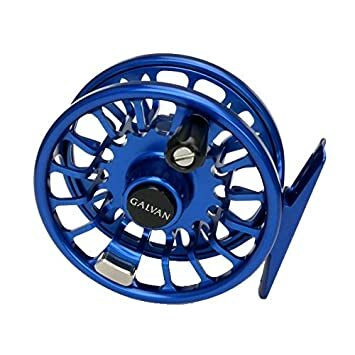 I didn’t NEED a new 8 wt, but I did WANT a new 8 wt. and I, in fact, got a new 8 wt. 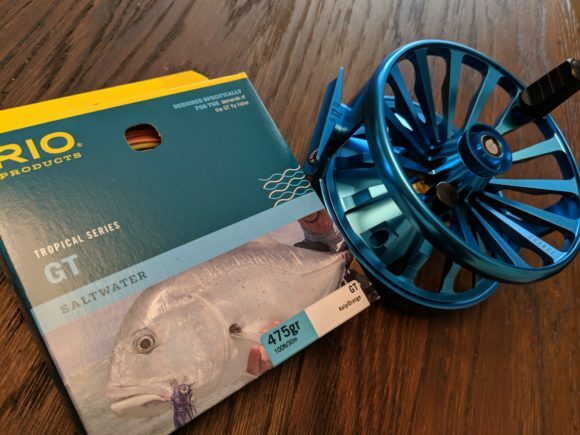 And… ya know… what’s a new rod without a new reel? So, I picked up a Behemoth as well (cheap and powerful, a good combo). 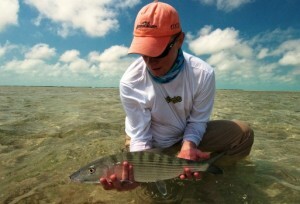 Had to get a new line too, of course… so I added another RIO Bonefish line to the arsenal. 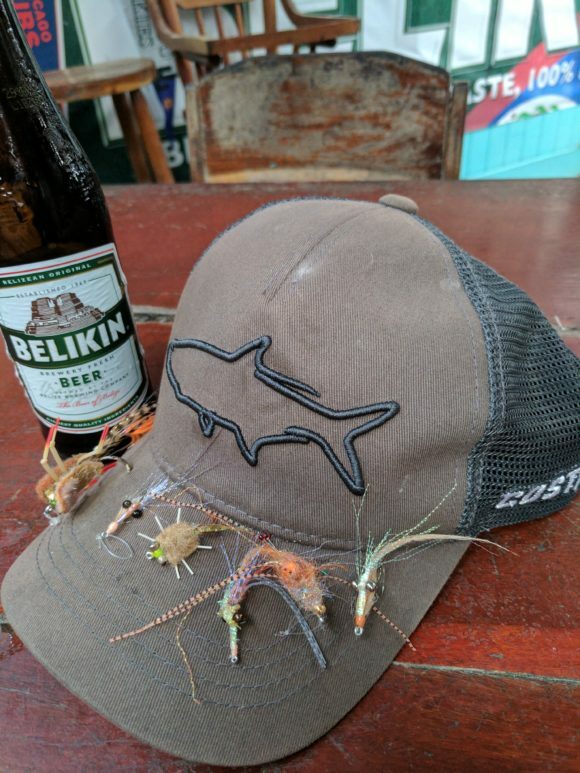 I could have fished a week without any of these things. I could have gone on with exactly what I have and I would have been fine. But… ya know… I wanted that stuff. I also picked up a new hooded sun shirt from Patagonia which I hope will keep me from burning anything important in my on-going quest to appease my wife and not die prematurely. I should add it would NOT appease my wife for me to die prematurely. So, I got a new shirt. I have a lot of shirts. 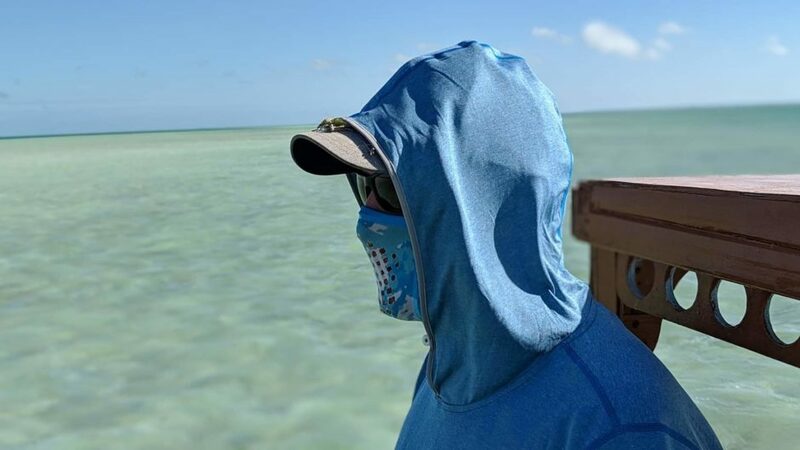 I have favorite shirts and lucky shirts and shirts that are jinxed or hexed and shirts with no known ability to attract or repel fish of any kind. I didn’t need a new shirt. But I did want a new shirt. 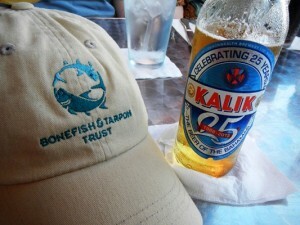 I wanted two, actually, and so I also got a new Redington bonefish shirt. Flyfishing attracts gear-heads, it seems, and while it sometimes seems outright dumb to buy and buy and buy there is also something entirely enjoyable about sliding a new rod out of a rod tube and putting backing on a new reel, just as there is something deeply fulfilling about adding the 304th fly into the fly box. So… YOU DON’T NEED NEW GEAR! But, that’s not really why we buy the gear in the first place.